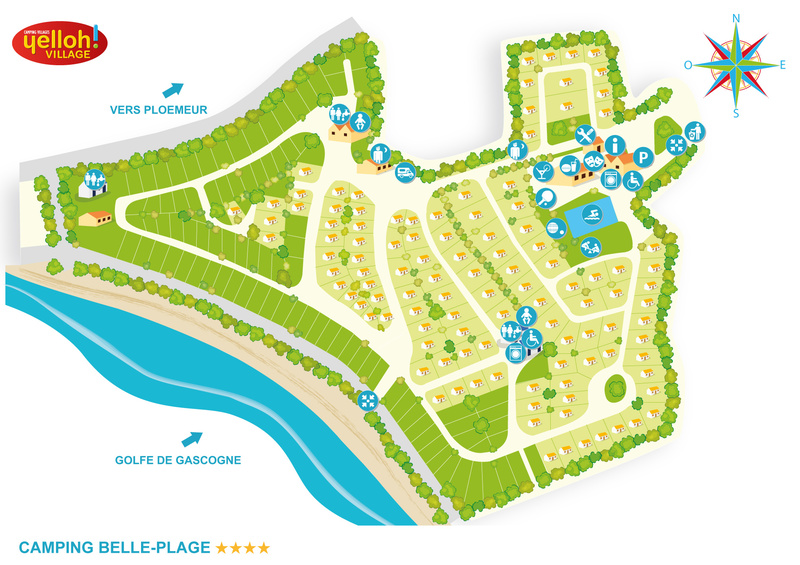 Come and discover Morbihan during your next camping holiday at the Yelloh! Village Belle Plage. From the menhirs of Carnac to the ancient village of Poul-Fétan, the wild beauty of the islands (Ile de Groix, Ile aux Moines, les Iles Glénan), from the walled town of Concarneau to the artists' stronghold of Pont-Aven, explore Brittany's history via our historic and cultural heritage, while sportspeople and people who love the sea will enjoy our beaches and the various activities available in the region. You'll also love walking in La Trinité sur Mer, Ploemeur, Auray and in the old harbour town of Saint Goustan. Step aboard the Lorient river bus and set off to the Citadel of Port-Louis in Lorient and explore its museums. You'll love the Musée de la Compagnie des Indes de la Ville de Lorient and the Musée National de la Marine, with the variety of items on show (models, porcelain items etc.) which bear witness to the rich trade with the Indies, as well as the history of the navy through the centuries. The FLORE lies in the former submarine base built by the Germans from 1941 in a 26 hectare area, and is a relic of the Second World War. Find out about the day-to-day lives of the submariners and the way these mysterious craft function. During your visit, a spectacular production also highlights the major historical events of the 20th century seen from the point of view of the strategic harbour of Lorient. Using an audioguide, you'll end your visit by having a look around the FLORE submarine, which makes for a unique time spent with the old submariners with their wealth of stories to tell. A visit lasting more than 3 hours; experience the adventure of modern sailing and journeys into the open sea via a permanent exhibition feature with films, recreational manoeuvres, unique reconstructions, simulators and all sorts of other surprises. At la Cité de la Voile Eric Tabarly, you can manoeuvre, hoist the sails and experience the feelings of navigation under sail via a dynamic simulator, and confront the forces of the ocean, design your own sailing ship, climb on board (virtually!) a multihull for setting out to sea, facing the world's best skipper, all immersed in sounds and pictures. And if that's not enough? Then climb aboard a group sailing boat in Lorient and feel the sails fill with wind and the hull gliding over the water. Lorient's Interceltic Festival is a festival of Celtic music which is held every year in Lorient, Brittany. It sees dozens of bands from countries and regions with Celtic origins coming together for 10 days, during the first two weeks of August. Highlights include the Grande Parade Celte, events featuring cotriades (Brittany fish stew), les Nuits Magiques, les Nuits Celtiques and the Défilé des Bagadou procession. Just 2km from the sea and from the little town of Ploemeur, Lorient, bring the family along and enjoy the 12 routes available here, in a thoroughly seaside setting! From tree to tree, with your family or friends, come and try the different amusements, featuring ladders, nets, footbridges, boarding ropes, surfing, sea racing and 40 zipwires. Loads of fun! Having set sail from Lorient, come and discover Ile de Groix, an authentic Breton island that people always love. Step aboard in the harbour of Lorient or, in summer, at the harbour of Lomener and come and discover the fishermen's houses built entirely of stone, as well as the colourful exteriors, go cycling along the coast and enjoy the clear blue waters of the inlets! In Groix, the facilities have remained limited: there are no traffic lights, just one roundabout and so few cars. A real dream! Poul-Fetan, in Morbihan, is a Breton village from another age. Come and share a lovely time with your family or friends in a village of cottages in which life is lived 19th century style! Discover its local specialities, including ancient cultures, vegetable gardens, cereal growing areas and farm animals. Take part in some of the activities that were central to daily life (washerwomen, wool-spinning, milking the cows, starching cuffs and making churned butter etc.) and have a go at one of Brittany's 16 different games (échasses (stilt-walking), skittles, palets bretons (puck throwing) etc.). Really unusual! Pont-Scorff zoo is a zoological park located in Pont-Scorff, in the Pays de Lorient, Brittany. It has a major zoological collection comprising large mammals (Asian elephants, hippopotamuses, black rhinoceros), a wide range of wild cats (lions, tigers, leopards, pumas etc. ), various herbivores (giraffes, zebra etc. ), primates, birds etc. Five shows and various entertainment make this a major educational attraction in the region. Located in Plumelin-Locminé, beside the RN24 linking Rennes and Lorient, and just 30 minutes from Lorient, come and see the Kingoland amusement park during your holidays at the Yelloh! Village Belle Plage! Try some of its exciting amusements like the Grand 8, the Galion maudit, the Gravity, the Timber Splash, merry-go-rounds for the little ones and car racetracks. People of all ages are just bound to love it here!